LOST BEHIND-THE-SCENES footage from the making of James Bond film The Spy Who Loved Me has been found in time for the secret agent’s 50th anniversary. The rare footage comes from a recently recovered edition of children’s TV show Clapperboard — “ Behind the Scenes on The Spy Who Loved Me” — dedicated to the making of the film. The 25-minute programme (Tx 17/1/77) also includes a lost interview with famed Bond set designer Ken Adam, who was nominated for a BAFTA for his work on the movie. Notably, the 1977 film starring Sir Roger Moore as 007 featured a supertanker set which was the largest sound stage in the world at the time it was built. The show is one of two editions of ITV’s Clapperboard passed on to classic TV organisation Kaleidoscope by a contact involved in the making of a new James Bond documentary being produced for the film franchise’s 50th anniversary. The other, from 14/2/77, also features Adam — who made his name with his innovative, semi-futuristic sets for the James Bond films of the 1960s and ’70s — but looks more at his other work such as “Chitty Chitty Bang Bang” and “Sleuth” with Michael Caine and Laurence Oliver. Both episodes come from 91-year-old Adam’s personal collection and have now been transferred from the original U-Matic broadcast tapes to digital format. SEVENTEEN MINUTES’ of missing footage from Stanley Kubrick‘s seminal sci-fi film 2001: A Space Odyssey has been found in an underground archive. Material believed to be among the footage include additional scenes from the Dawn of Man opening sequence; more footage of the Jupiter Expedition astronauts onboard the Discovery; a scene showing HAL breaking off contact with Earth before the computer alerts the crew that the AE-35 antenna has “malfunctioned”; and more footage of Frank Poole outside Discovery trying to fix the damaged antenna. The discovery was announced by 2001‘s effects supervisor Douglas Trumbull during a talk before a movie audience in Toronto, Canada. The visual effects legend, who was presenting a 70mm print of Kubrick’s 1968 masterpiece, revealed Warner Bros. had discovered the complete and perfectly preserved component negatives of the lost footage in a Kansas salt mine, where it had been stored and forgotten for the last four decades. Warner Bros. is said to be considering how best to use the footage. According to Wikipedia, Kubrick filmed several scenes that were deleted from the final film. These include a schoolroom on the moon base (a painting class that included Kubrick’s daughters); additional scenes of life on the base; Floyd buying a bush baby from a department store via videophone for his daughter; details about the daily life on Discovery; additional space walks; astronaut Bowman retrieving a spare part from an octagonal corridor; a number of cuts from the Poole murder sequence including the entire space walk preparation and shots of HAL turning off radio contact with Poole – (explaining the non sequitur of HAL’s response to Bowman’s question); and notably a close-up shot of Bowman picking up a slipper during his walk in the alien room – the slipper can still be seen behind him in what was then the next shot. The most notable cut was a 10-minute black-and-white opening sequence featuring interviews with actual scientists, including Freeman Dyson, discussing extraterrestrial life, which Kubrick removed after an early screening for MGM executives. The text survives in the book The Making of Kubrick’s 2001 by Jerome Agel. If the music intro and outro are included, 29 minutes’ worth of film were excised from the theatrical version. Kubrick’s decision to cut the film was to tighten the narrative. Contemporary reviews suggested the film suffered too much by the radical departure from traditional cinema story-telling conventions. Regarding the cuts, Kubrick stated: “I didn’t believe that the trims made a critical difference. The people who like it, like it no matter what its length, and the same holds true for the people who hate it”. According to Kubrick biographer Jan Harlan, the director was adamant the trims were never to be seen, and that he “even burned the negatives” – which he had kept in his garage – shortly before his death. Douglas Trumbull was one of four special effects advisers on 2001 and helped create the realistic and immersive effects that give the film a sense of realism and scale befitting Kubrick and Arthur C. Clarke’s epic screenplay. He had been working on a new documentary with David Larson about the film, 2001: Behind the Infinite – The Making of a Masterpiece, but confirmed at the Toronto screening that Warner Bros. had “pulled the plug” on the project. The duo are now putting together a book featuring Trumbull’s recollections of working on the movie, plus a number of behind-the-scenes photos. 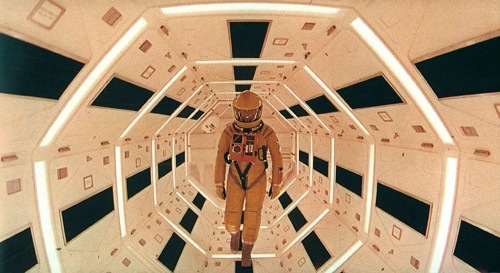 READ ON: Coming Attractions 17/12/10 – 17 minutes of lost 2001: A Space Odyssey footage found. Ain’t It Cool News 17/12/10 – Warner Bros. Just Found 17 New Kubrick-Edited Minutes of 2001 In A Salt Mine!! What?? Tagged as 2001, 2001: A Space Odyssey, Arthur C. Clarke, David Larson, discovery, Douglas Trumbull, Frank Poole, HAL, Kansas salt mine, missing footage, Stanley Kubrick', Warner Bros.
WITH Halloween just around the corner, one of my favourite sites – Cinemassacre – has posted a video countdown of the top 10 lost horror films. Chosen by the Angry Video Game Nerd himself, James Rolfe, the list features some interesting choices among the usual suspects. Click the image below to see the vid, hosted over on Spike.com. BBC News – Newsnight – What makes sci-fi epic Metropolis so influential?. A LOST Charlie Chaplin film has been discovered at an antiques show in America. Early Days: A still from "A Thief Catcher". 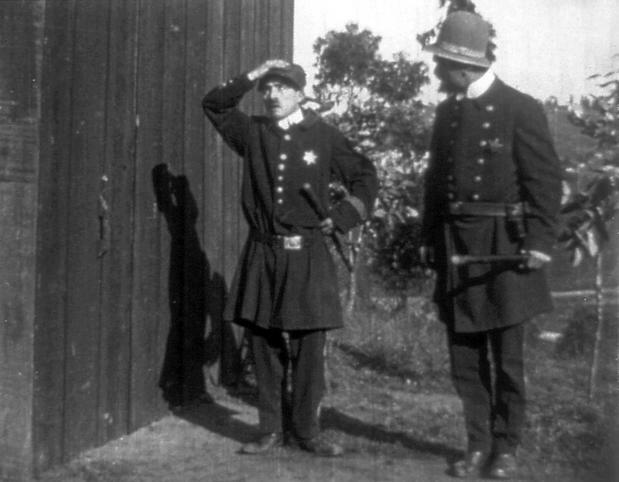 The 10-minute silent film – a Keystone comedy called A Thief Catcher – features the English comic actor in a cameo role. It is reckoned to be one of the first, if not the first, cinematic outing for his famed ‘Tramp’ character. The 16mm print was found last year in Michigan by internationally respected film historian and collector Paul Gierucki. Gierucki says he didn’t get round to viewing the print until March this year – thinking it was just another old Keystone comedy. But when he did, he spotted an unmistakable moustached Keystone Kop and realised he was watching a previously unknown Chaplin film. He confirmed his find with fellow collector Richard Roberts, sending along a frame grab. Though Chaplin’s Tramp character was first presented to the public in Kid Auto Races at Venice (released Feb 7, 1914), it was filmed AFTER Mabel’s Strange Predicament, which hit cinemas two days later, on Feb 9. A Thief Catcher, though, began production on January 5, 1914 – one day before Mabel’s Strange Predicament started shooting. Roberts said: “It’s either his second moustache picture or his first. It cements the concept that he had the character before he came to Keystone and didn’t slap it together on the way to the shooting stage one day. A Thief Catcher stars Ford Sterling, Mack Swain and Edgar Kennedy. It was the 36th film Chaplin made and he appears on-screen for around three minutes. It was filmed about a month after Chaplin started work at Keystone Studios, in Edendale, California, and was released by the Mutual Film Corporation on February 19, 1914. According to Roberts, the film “fell through the cracks pretty quickly” and was not included in a Chaplin filmography compiled by the British Film Institute in the late 1930s. 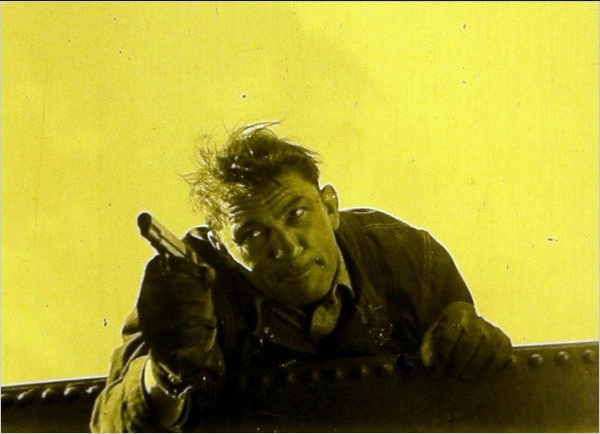 Until its discovery, the short – which is said to be in “decent” condition – was thought to be among the estimated 75 per cent of all silent films that have not survived to the present day. A Thief Catcher will get its first showing in over 90 years at Slapstickon, a comedy film convention in Rosslyn, Virginia, on July 17. You can read more about the discovery on the Washington Post website. A CACHE of previously unseen photographs from the filming of seminal ’70s horror movie The Wicker Man have solved a long-standing movie mystery. The rare images, hidden away in a suitcase for almost 40 years, confirm the existence and substance of missing scenes from the acclaimed cult horror. 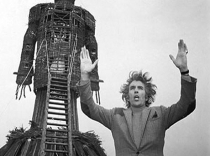 Following the film’s release in 1973, Christopher Lee, who played sinister Pagan devotee Lord Summerisle, claimed several scenes had been cut. The contents of that missing footage and its eventual fate have never been solved, though it has been suggested the negatives were used as landfill during the building of the M3. With the discovery of the pictures, in the attic of photographer John Brown, some gaps at least can be filled – namely, that the scenes were indeed filmed as Lee stated. Brown was employed to document the film and the images, including stills from missing scenes, are to be published for the first time in a revised edition of Inside the Wicker Man, by Allan Brown. There’s a highly informative story on the discovery over on The Times website.